NASA has captured the unexpected trajectory of a comet in a 15-second space video as it whizzed around the sun within 2.2 million miles (3.54 million km) of its blazing hot surface. Discovered by NASA’s Solar and Heliospheric Observatory (SOHO), Comet 2,875 is interesting for two reasons. Firstly, it is not part of any known family of comets. Most comets seen by SOHO belong to the Kreutz family – a single comet that breaks into smaller comets the closer they moved towards the sun. Secondly, most comets that come close to the sun, called sungrazers, do not survive as they are evaporated by the intense heat. The action of comet 2,875 was caught on February 18–21. The video shows the comet approaching from the right side of the frame, circling the sun and emerging on the other side. The sun spits out a coronal mass ejection near the end for extra dramatic effect. "There's a half-decent chance that ground observers might be able to detect it in the coming weeks," Karl Battams, a solar scientist at the Naval Research Lab in Washington, DC, said in a released statement. "But it's also possible that events during its trip around the sun will cause it to die fairly fast." Comets are icy bodies, regarded as fossils from when the solar system was originating, and they could provide scientists with some of the primordial material. When passing close to the sun, they heat up and begin to outgas, displaying a visible atmosphere or coma, and sometimes also a tail. These phenomena are due to the effects of solar radiation and the solar wind upon the nucleus of the comet. 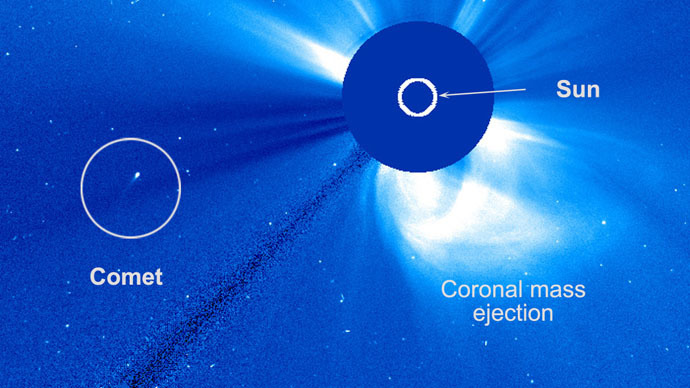 The space drama was captured as part of NASA’s SOHO project – a collaboration between the European Space Agency and NASA. Launched in 1995, the project is designed to study the internal structure of the sun, its outer atmosphere and the origin of solar wind – the ionized gas that blows throughout the solar system. The project has become the number one comet finder, charting over 2500 comets sightings since observations began.